Want to find out more about the CRE? Come to this free evening event! 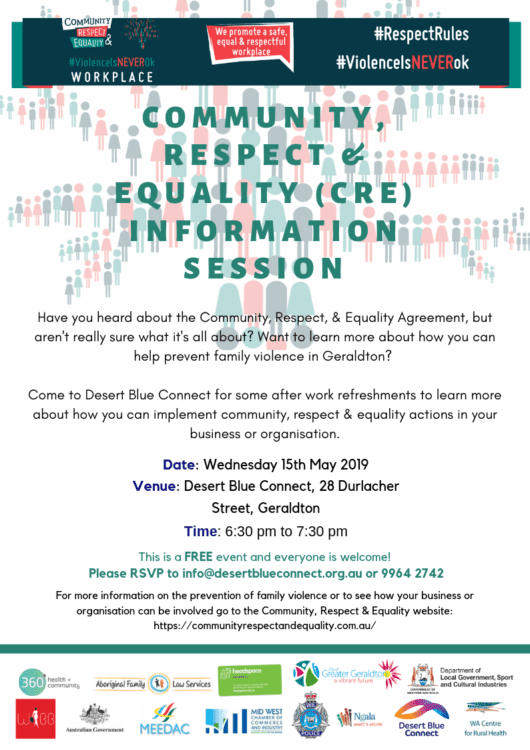 Desert Blue Connect will host a Community, Respect & Equality information session at the Desert Blue Connect, 25 Chapman Road, Geraldton, on Wednesday 15 May from 6:30 to 7:30 pm. People can come along and find out what the CRE Agreement is and how it can be applied to their business or organisation. Everyone is welcome and refreshments will be provided. Please RSVP to info@desertblueconnect.org.au or call 9964 2742.